Wheel alignment is also sometimes referred to as wheel tracking and should be part of standard vehicle maintenance. This involves adjusting the angles of the wheels tot he recommended position as outlined in a vehicle's manufacturer specification. It contributes to the reduction of tyre wear and ensures the optimum performance and handling of the vehicle on the road. Failure to check this may lead to unnecessary pulling or wear and tear on the tyre. Drivers may not notice potential defects at first but after time it can cause lasting damage. Typical side effects can be steering vibration, which can cause driver fatigue through constant pressure, and the vehicle pulling to one side. 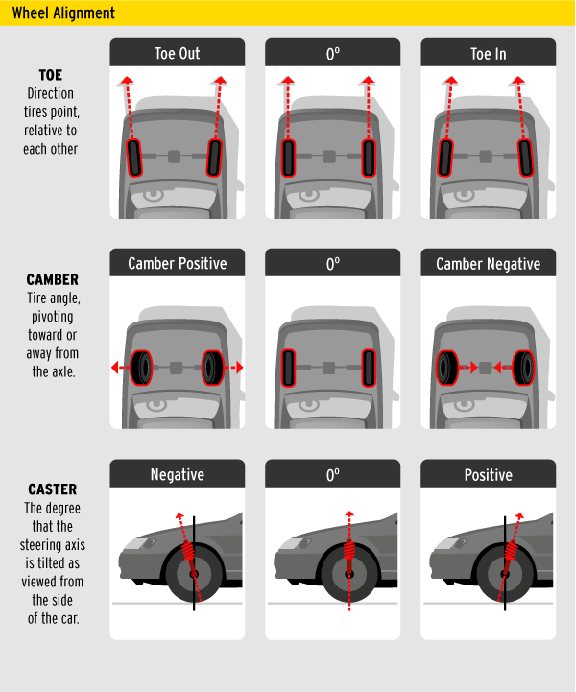 Tyre wear is not the only area of the vehicle that can suffer if correct wheel alignment is not set. Braking distance, driving quality and even fuel economy are all affected. Audible distress while turning corners. Incorrect wheel alignment can also supply undue pressure to tyres which can cause them to lean into one another. When this happens your vehicle faces resistance on the road surface, making the car work much harder to drive in a straight line and therefore it burns up more fuel than normal, which is bad for your wallet and the environment.